At various fora, airline operators in Nigeria have accused the Federal Government and the Ministry of Aviation in particular of killing indigenous airline operators by granting multiple entries to foreign airlines , this has been cemented by the fact that more foreign airlines have applied and are being granted more frequencies into the country. This is an article written in 2011 and is germane in the sub-sector today . Federal government once again signed another agreement to enable a strong African carrier, Kenyan Airways to fly into the country through Abuja adding more frequencies to their flight into the country through Lagos. Ministry of Aviation signed into agreement for Kenya Airways to commence Abuja-Nairobi operations in July 3 as part of its plans to provide a far more improve services to its numerous customers in Nigeria. However, these multiple entries have not gone well with domestic airline operators who feel that soon they will no longer have domestic passengers to fly as all the airlines will be flying into the country from every existing airport.Experts in the industry feel that they have spoken enough about the Ministry of Aviation’s insensitivity to the survival of the indigenous carriers and are of the opinion that they are barking up the wrong tree. As of today, over 24 foreign countries operate flights in and out of Nigeria with over 90 frequencies weekly while airlines like Lufthansa, British Airways, Virgin Atlantic and Air France all operate over 48 frequencies into the country weekly, with direct flights into Lagos, Port-Harcourt and Abuja. As at the last count, no fewer than seven airlines operate multiple entries into Nigerian airports. British Airways operate into Lagos and Abuja, Virgin Atlantic to Lagos, Abuja and Port Harcourt, Air France to Lagos and Port Harcourt, Ethiopian Airlines to Lagos and Abuja, Kenya Airways to Lagos and Abuja, KLM to Lagos, Kano and Port Harcourt and Delta Airlines to Lagos and Abuja airports. In all, foreign airlines like BA, Emirates, Virgin Atlantic, Air France, Delta Air, Qatar Airways, South African Airways, Egypt Air, Kenya Airways and Turkish Airways repatriated over N200 billion in one year while the only indigenous airline with appreciable share of the ticket sales was Arik Air. Other airlines like Emirates earned N21,522,232,269.60 on tickets, Virgin Atlantic (N11,832,010,763.40), Air France (N10,859, 450,927.40), KLM, (N10,507,299,275), Delta Air (N7,001,304,508), Qatar Airways (N6,799,302,758), South African Airways (N5,775,448,204), Egypt Air (N4,831,799,154.60), Kenya Airways (N2,807,340,905) and Turkish Airlines (N1,825,406,905.40). Alitalia (N931,339,519); Iberia (N769,187,923), Saudi Arabian Airlines, which only flies into to Kano from Jeddah, grossed N846,133,401; China Southern Airlines (N769,187,932), Afriqiyah (N302,496,743), Royal Air Maroc, which began operations a little over a year ago, made N266,627,990. The only Nigerian carrier among the big players; Arik Air recouped N4,343,492,015 from ticket sales. The Arik Air Chairman, Sir Arumemi Ikhide who has always been on the forefront in the fight against capital flight from the airline industry said that foreign airlines were taking advantage of this negligence and are making brisk business in Nigeria, much to the detriment of the naira. “The foreign airlines are having a field day. Some time ago when Nigerian aviation was in poor state, our foreign reserve was weak. Most of the airlines didn’t come to Nigeria but as soon as we had this fiscal regime and our foreign reserve was increasing, and things started to look up they all started coming. In fact, if you look at most of them, during the hajj seasons they all come; when it is low season they all abandon Nigeria,” he declared. He also flayed the attitudes of Nigerians who fly foreign airlines just to show off, saying that almost all foreigners hardly fly Nigerian airlines but their own carriers. According to him, Arik operates one of the most modern aircraft on the Lagos London route but for status most Nigerians even government officials refuse to fly their own. He regretted that none of the foreign carriers have added any value to the aviation industry as there are no Nigerian professionals in their employ. “You look at a lot of issues; all these people are not even helping us and none of the foreign carriers has Nigerians as there captains or cabin crew. But they have been coming here for over 70 years, they have been exploiting us and we don’t see anything wrong in it. So I think it is high time we took our destiny into our own hands and…understand that the world is not going to wait for us, nobody is going to help us; we have to help ourselves. “The government has to make a policy and Nigerians themselves, even without government policy, have to take pride in their own product. Yes, we have made some mistakes. We are just about four years as an airline and two years now as an international airline. Some people told me that we don’t have frequent flier when we started in those days. Before British Airways came, there was no frequent flier. We should understand that before Arik came, Nigerians were treated like dogs by some of these foreign airlines. Open skies is an international policy concept, which calls for the liberalisation of rules and regulations on international aviation industry most especially commercial aviation – opening a free market for the airline industry. Its primary objectives are to liberalise the rules for international aviation markets and minimizes government intervention. The provisions apply to passenger, all-cargo and combination air transportation and encompass both scheduled and charter services. The policy is good in its way if services were reciprocated but this is not so in Nigeria. The President, Aviation Round Table, Capt. Dele Ore who also spoke on the subject said that Nigeria has not gained anything from the policy and said the authorities should give a notice of termination of the agreement. Ore observed that the policy has only favoured foreign airlines over their Nigerian counterparts, as billions of Dollars is being made by foreign airlines in form of capital flight while the revenue of the indigenous carriers has continued to dwindle. He pointed out that the country does not belong to the open skies club as Nigeria does not have carriers that can compete with the foreign airlines, adding that the policy is expected to in the long run favour the country that enters into the agreement and then, the consumers of aviation services of those countries. He agreed that the policy remains the best available model countries can explore to save customers’ time and money or save airlines’ cost of operations, but said it is still a work in progress, stressing that much work is left to be done, as many countries are not maximising the benefits that come with the policy. He recalled that the agreement was signed in the hey days of Nigeria Airways when the airline could at least reciprocate some of the frequencies operated into Nigeria from Dubai, London, Johannesburg, Kenya, US and others. He said the reverse is now the case, as foreign airlines continue to take undue advantage of Nigeria’s non-reciprocity. An aviation consultant, Mr. Olumide Ohunayo said that rather than for the open skies policy to assist in operational cost reduction, it has however compounded the problem as Nigeria lacks direct flights to countries it has agreement with. Ohunayo emphasized that the signing of the open skies policy with the US was too hasty as this was done when Nigeria did not have airlines that were capable of operating that route coupled with the American Federal Airports Administration (FAA) Category One Status encumbrance, which he said should have been negotiated with the open skies. He said that Nigeria only asked for a five-year grace from America for “non-existent flag carriers,” which at the end of the day was not utilised. He said, “Nigeria should have exercised constraints upon embarking on the open skies policy, as the European Union, Australia, Brazil and some other countries negotiated the term of agreements, demanding for some concessions such as delay in start off, slot allocation, ownership restriction, entry points, certification status, even on other business issues not related to aviation. United Airlines had come into the country in December and they were welcomed by the Minister of Aviation, Mrs. Fedelia Njeze, who with the FAAN managing director, Richard Aisuebeogun were ecstatic about United. However, if they had listened closely to Charles Duncan, Vice President of United Airlines they would have heard him say Nigeria was the first destination they were flying into that the Minister came personally to welcome them. Secretary General of the Nigerian Aviation Professionals Association (NAPA), Comrade Saidu Abdurazak, alleged that greediness and corrupt tendencies of the government allowed dual designation of foreign airlines. According to him, apart from open skies policies, which is said is working against the growth of the domestic airlines, they are also going bankrupt as the passengers they were supposed to pick and distribute are regularly been distributed by foreign airlines within the country. He argued that the essence of the policy has been defeated, as government opened the skies to foreign airlines to destroy Nigerian airlines, and challenged the National Assembly to wake up to their duties and repeal the policy. “Foreign airlines take billions of dollars from this country but the National Assembly unlike legislators in other countries, who guard their economies with good laws, is not doing anything about it, they allow the symbol of our national unity to be wished away. “The domestic airlines are suffering with the apathy turned against it by even the Nigerian passengers. 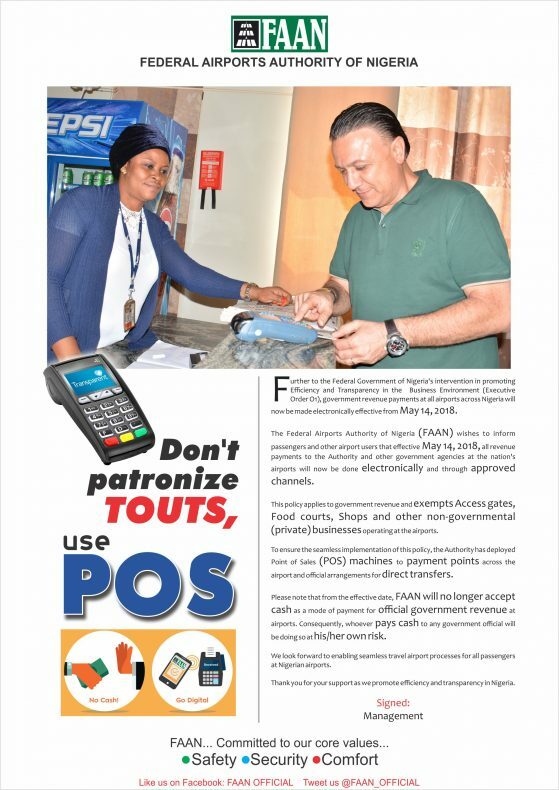 You hardly see Nigerian officials patronising the domestic carriers whenever they are travelling out of the country. If the government officials who are supposed to embrace the indigenous airlines are not doing so, who else do you expect to patronise it? He queried. Abdurazak called on government to immediately stop the multi designation of foreign airlines and develop, empower and equip at least three Nigerian airlines to international and competitive standard to compete with their foreign counterparts.